Professor Scott is presented with gifts by Professor Sibnath Deb, Dean of Law, Pondicherry University. 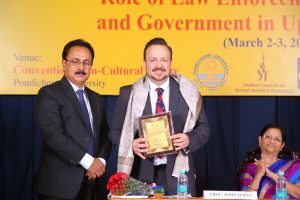 Professor John Scott has recently returned from Puducherry (a part of French India until 1954), India where he presented a keynote conference paper on the theme of ‘Southern criminology and cognitive justice’. The two day conference, organized by the School of Law, Pondicherry University (A Central University), examined The Role of Law Enforcement Authorities and Government in Upholding Justice. Distinguished presenters at the national conference included Justice N. Santosh Hegde (Former Judge, Supreme Court of India), Justice Indira Banerjee (Chief Justice of Madras High Court, Chennai), Justice Ravi R. Tripathi (Law Commission, Government of India) and Mr. V. Narayanswamy (Chief Minister, Puducherry Union Territory). Scott made the case for a globally inclusive criminology noting that Australian, US and British textbooks ignored crime in the Subcontinent. This was especially striking in the case of Australia and Britain given the shared legal, social and political history. He argued that the extent of neglect exposed a bias in the way in which criminological knowledge was produced and disseminated and discussed the historic development of criminology in India and its growth over the last few decades. Major themes of the conference included access to justice, human rights, the role of police and political corruption. Approximately 200 people attended the conference.